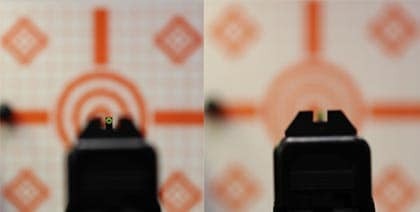 Night sights are one of the best upgrades on a pistol and with a cornucopia of choice available in today’s market, many companies offer products in this category. A recent newcomer, called Night Fision, stepped onto the scene to shake things up a bit. In 2017 the company came to market with some new products and different approaches to a somewhat staid market. It turns out Night Fisions’s origins are tied to another company that has a great deal of experience with making things glow in the dark—Cammenga. Many with experience in land navigation — military especially– know the proven quality of the Cammenga compass providing lensatic compasses to the U.S. Army for decades. In addition, the company boasts over 25 years of working with the magical component that makes things glow, tritium. Remember glow in the dark Silly Putty? If you shined a bright light on the weird goop, it would glow brightly for a while before it faded. 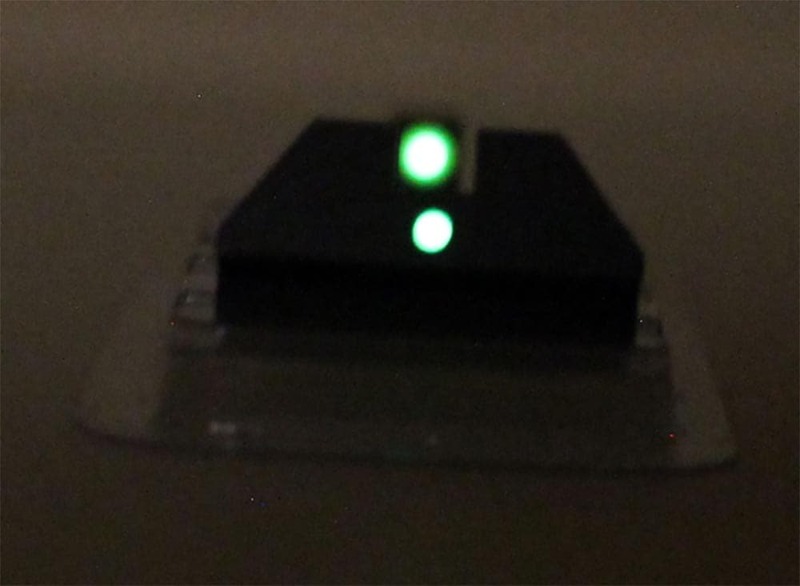 Tritium, a radioactive gas, is different in that it needs no external source to charge or maintain its brightness. Night Fision claims to possess a new polymer containment cup for their vials with tritium 30-percent brighter than anything else on the market. With every intention of popping a set on the Gen 5 Glock 17 I’d recently acquired, Night Fision was kind enough to send me a pair for installation. The packaging suggests using a qualified gunsmith for installation and it’s not a bad idea. 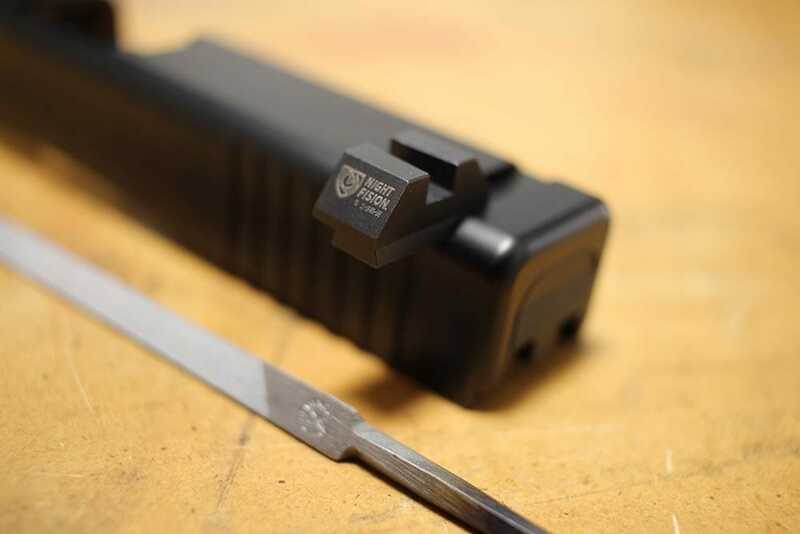 While a front post on a Glock is a piece of cake, the rear sight can be a challenge. For these sights, I filed the dovetail down in order to get a good fit. Once installed, I headed to the range. For daytime use, the sights were superlative. My accuracy became more fine-tuned because of a decent gap viewable from the rear sight to the front. With equal distance on both sides, I was hitting right where I needed. The sights, not quite suppressor height, proved a little taller than normal. In addition, their 4140-steel construction makes them durable. These sights tackle single-handed reloads in a snap, hooking onto nearly anything to allow racking of the slide. 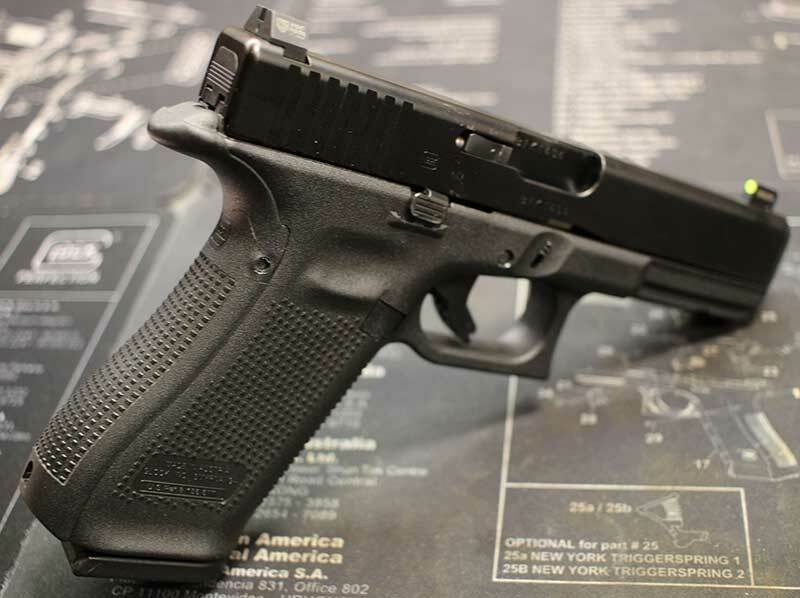 It took me a bit to get used to the black rear sights, however, different configurations are available on their website to suit individual needs. Brighter than any other tritium products I use, Night Fisions are tough, CNC-machined in America and treated with black Nitride. In addition, the company offers a 16-year warranty on the luminescence of their tritium vials. With different models of night sights for many weapons brands these sights vary in prices depending upon selected options. In any lighting scenario, the Night Fision sights prove outstanding.